You know things went well when Rob Chubb and Jake “Beat the Dawgs Like a” Drum (pictured above) make the postgame photo gallery. 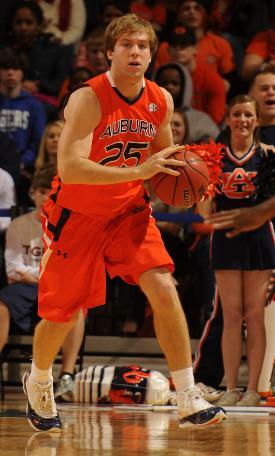 The recurring theme of this Auburn men’s basketball season has been: They can do everything. They just can’t do it all at the same time. — Turnovers. We expected sticky-fingered Auburn to take advantage of the Dawgs’ generous, giveaway-happy ways, and sure enough, the Tiger starters under-turnovered their Georgia equivalents 7-to-16. (Final overall tally? Auburn 11, Georgia 19. Win.) Poor Dawg forward Trey Thompkins turned the ball over 6 times in only 13 minutes. — Balance. Lucas Hargrove had a monster night with 24 points on just 14 shots, but Waller, Sullivan, and Reed all finished in double-figures while Brendon Knox chipped in 9 points on 5 shots. Auburn’s m.o. has been to have one player blow up while everyone else straggles along; getting this many contributions from this many players was the difference between a competitive game and the easy blowout. — Defense. You could argue that everything started for Auburn with their interior defense: the Tigers held the Dawgs to 7-of-19 first-half shooting inside the arc and ended up forcing Georgia–one of the country’s most interior-oriented teams, at 335th in 3’s as a percentage of total shots–to take nearly a third of their field goal attempts from deep. Result: a 5-of-16 outing from 3 for the game, and just .89 points-per-possession to Auburn’s 1.12. — Finishing. We’ve seen Auburn put it all together for stretches, for a half, even for 30 minutes. Last night they scored the game’s opening basket (a Hargrove three, fittingly) and never gave up the lead, turning a one-point advantage at the first half under-8 timeout into a 9-point lead at halftime … and a 13-point lead at the second-half under-12 timeout … and a game-icing 19-point lead by the six-minute mark. The foot never came off the pedal. Even this performance wasn’t quite perfect–a shade more three-point shooting would be nice, especially from Waller–but it sure was nice. And combined with having taken a suddenly red-hot Arkansas team to overtime in Fayetteville, this is probably the best two-game performance of Auburn’s season-to-date. Of course, the runner-up for “best two-game performance” honors would likely be edging Virginia and taking Florida St. to the wire (at FSU) back in December, which they promptly followed up by giving up 107 points to Sam Houston St. So I wouldn’t go proclaiming any corners turned just yet; we said that Auburn had to win three games in this past four-game stretch, and not only did they not pull that off, they came within one point against ‘Bama of going 1-3. Still: on the evidence of the Arkanas outing, last night’s beatdown, and to a lesser extent the improvement down the home stretch shown by last year’s team, not all is lost just yet. Auburn finally put things together; in the event they keep them together, things could get interesting. NITalk. This is the target now, right? Particularly where Jeff Lebo is concerned; as disappointing as this season may have been, from where I’m sitting a second straight berth in the premier non-NCAA Tournament tournament* would almost certainly buy him another year. Maybe his team would have just missed the NCAAs in ’09 and barely scraped into the NIT in ’10, but when you compare that the final results would nonetheless be 1. NIT 2. NIT, that’s going to look like enough water treaded. Lebo might or might not keep his job in the event the Tigers miss, but if they get in, it’s awful hard for me to see him not at the helm in ’10-’11. So … what are their odds? Still not good, unfortunately. NITology–always your first and only stop for NIT projections–didn’t even have Auburn on the NIT bubble as of yesterday. Which makes sense, considering that Auburn was under .500 at the time. But SEC teams that finish over .500 (remember, you have to have a winning record to be eligible) always have a good shot at squeaking in, as you can see by Alabama’s inclusion as the last team in in NITology’s projection. So, can Auburn sneak over the .500 mark? At 12-12 and with 7 games remaining plus the SEC tourney remaining, the goal is to go 4-3 and win their opener in Nashville. It won’t be easy. Auburn will have to sweep their three remaining home games and pick off one of their four road games. The former seems entirely possible, as the opponents are Arkansas (who Auburn’s already played to a virtual draw), LSU (the worst SEC men’s basketball team in memory), and Miss. St. (only .500 in league play so far). Finding a road win is tougher, though–the destinations are Starkville, Gainesville, Oxford, and Tuscaloosa, and Auburn will be a clear underdog at all four. Still, though, Alabama’s far from a heavyweight, and the Vandy/Tennessee trips have shown that Auburn can hang with superior opposition on the road for at least a while. Since neither the Bulldogs nor Gators nor Rebels are quite as superior as the Vols or ‘Dores, it’s not out of the question that Auburn could steal one. Even finishing at 16-15 would leave a lot of work to do, though. Winning one game at the SEC tourney would guarantee eligibility, but Auburn’s got so much ground to make up–they’re 143rd in today’s RPI–that to get a real shot at it they’d probably have to win two. Even then, the guess here is that it’d be dicey. 3. Win two games at the SEC Tournament, the second one of which would come against a top-four seed. No, I’m not optimistic. But it’s worth pointing out that it does remain, for the time being, a possibility … and one Jeff Lebo no doubt wants to keep in sight. If you’re interested. Dawg takes on the game–not happy ones–are available from Georgia Sports Blog and Dawgsports. Andy Bitter’s story on the game is worth a read and is here. Just about fell over after reading the final score last night. Thanks for the thorough recap. Plus, that was a really cool shoutout about the halftime show. I’ve seen them at the Nuggets twice and it is amazing to see. Awesome hoops stuff, as always. Yeah, that was a nice win to get. Everybody played well overall, although Tye Armstrong never really got in there, and it seemed like Reed got his minutes cut a little bit (haven’t looked it up, but that’s what it seemed like) which is kind of unfortunate because no matter how good we played last night with or without him, there’s still a zero percent chance the team is better off with Wallace or anyone else in the game. So hopefully this was just circumstances attributed to the big lead or personel or something. Quick Change was mind blowing, like every other time. You’d think after seeing them three times you’d figure out how they might do it, but nope, I’m convinced it’s legit Voodoo or something. And since I totally missed out on the capacity discussion last go round — Really, seeing as Beard-Eaves is 10,500, I think it’d be better if they dropped in on down even more. Like to 8,000 or so. I’d much rather have an actual atmosphere than a cavernous open space where you can hear the sneaker squeeks echoing out into the emptiness. Also, if a second NIT berth in six years stone-cold clinches a coach another year… well, then, that’s just depressing to think about.